I got to see two films this week. Horns with Daniel Radcliffe and Disney’s Big Hero 6. It was very much night and day, both movies. Horns had an interesting premise and could have gone so many places but didn’t know exactly where to put its focus on and the director didn’t have the skill to hold it all together. Whereas Big Hero 6 managed to keep all of its elements firing on every cylinder and hitting all the right notes with me. I could see where Big Hero 6 was leading up to but I didn’t care because it was so enjoyable. I saw the twists and turns but it didn’t matter because the Disney magic was working and I laughed and I cried and I felt the thrill. It had the same energy and vibrancy that made The Incredibles one of my favourite Pixar films ever. I grew up with comic books and superheroes and so this genre, when done well, brings back all of these memories and feelings from inside. 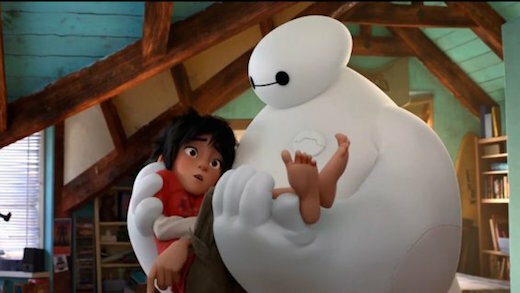 Watch it also for the short animated film Feast which comes before Big Hero 6. It’s absolutely adorable.